Sound: Soundboard & audience recording. Comments: The last concert on the 'Hot Space' tour in 1982. This concert is professional filmed & recorded. A 60 minute VHS video was released in Japan only in 1983, which become Queen's first live concert film release. Highlights from this film, is also included as a bonus on the officially worldwide DVD release 'Queen - On Fire Live At The Bowl' (live at the Milton Keynes UK 1982). This 'Wardour' release uses an incomplete (from the video/LD or DVD) stereo soundboard recording, mixed with the available audience sources to present the complete performance. A bonus DVDR (might be a silver pressed DVD), with the film of the officially released (Japan ONLY) VHS & later Laser Disc & also DVD release, is enclosed with stickers copies only. The bonus cdr, with a un-circulated audience recording, was enclosed with orders in week 12 - 2019 only. See info below. Note: This cdr are available as a single cdr release on his own. Roots: Audience live tape & officially released records. ★ is the SBD compensation point. ★ Only the first 100 will be released with a numbered sticker. ★ LIVE IN JAPAN: SEIBU STADIUM 1982 will be included specially as long as the sticker with the first number is included. ★ A special bonus title 'SEIBU STADIUM 1982: UNCIRCULATED MASTER' 1cdr will be included this weekend. This is a special project only this week. There is a case of manufacturer sold out when ordering. Please place an order upon acceptance. It is the final performance of "HOT SPACE TOUR" that spans 7 months, and the "November 3, 1982: Seibu Stadium" performance, which also became the official video "LIVE IN JAPAN". The best live album which becomes the decision board is appearance in permanent preservation press 2CD. The previous year's "THE GAME TOUR" was only Nippon Budokan, but in this tour, it turned around and conquered large venues in various parts of the archipelago from northern Hokkaido to southern South Kyushu. First, let's check the show's position in the schedule. ・ October 19: Fukuoka City Kuden Memorial Gymnasium "HOT SPACE TOUR 1982"
・ October 24: Hankyu Nishinomiya Stadium "STADIUM ROCK"
・ October 26: Nagoya City International Exhibition Center "DEFINITIVE NAGOYA 1982"
・ October 29: Hokkaido Industrial Cooperative Hall "GOT THE POWER"
Above, all 6 performances. Although Japan itself was the final destination of the world tour, the Seibu Stadium performance was the final performance. And this show is just a symbol of 1982. Above all it is big that it is left as an official video work, but it is famous not only that but also extreme audience recording. This work is a live album that makes full use of such many sources and penetrates the full show with the highest peak sound. First of all, the top priority was the official soundboard created from "LIVE IN JAPAN". 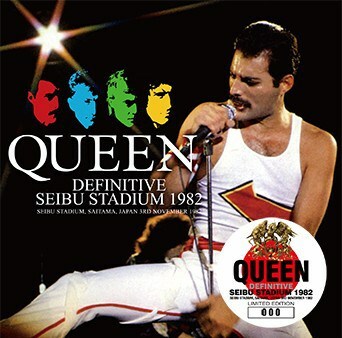 Currently, six songs are made into DVD as a bonus of "QUEEN ON FIRE: LIVE AT THE BOWL", but it is a long sound board released with a laser disc at that time instead. However, it is about one hour even if it says long, and it is not a full show. So I completed about 52 minutes missing in this work with a full audience recording. Moreover, the audience recording is not good enough. The master used is two kinds, the main is a super-name recording of the tradition. It was first published as Press 2 CD "SPACE BOOGIE", and it is a master of the best that shocked enthusiasts all over the world. Moreover, in this work, re-digitization from the original cassette again. The quality has been greatly improved. In fact, it sounds like a different thing in this work and "SPACE BOOGIE". Although the clearness of the air is simply different, it has improved to the thickness and direct feeling of the core more than that. Originally the details were vivid, but it jumped over the venue space and rang at the ear. The sound of the audience seems to indicate that the recording is definitely the same, but the sound itself seems to have approached the recording position several tens of meters. In our shop, although we still re-digitize the well-known recording along with the progress of the equipment, we can not think of an example with the quality up to this point. To be honest, at first it was thought that it was difficult to connect to the official sound board, but it was a jump-up grade that made it possible without difficulty. Furthermore, this work is fully utilizing another new excavation audience master. The quality itself is a partial use before the launch as it does not reach the SPACE BOOGIE master, but it reproduces the scene longer than any previous release. We realized live album to update the longest record. Of course, mastering is thorough throughout. Polish the sound of each of the official sound board + audience x 2 types closely, and connect the sounds carefully. It has been relaxed and corrected (as much as possible) to make contact sounds and coughing etc. that are hard to hear, and finished with a sound that allows you to taste the best performance sounds. That's why the full show I got is just DEFINITIVE. 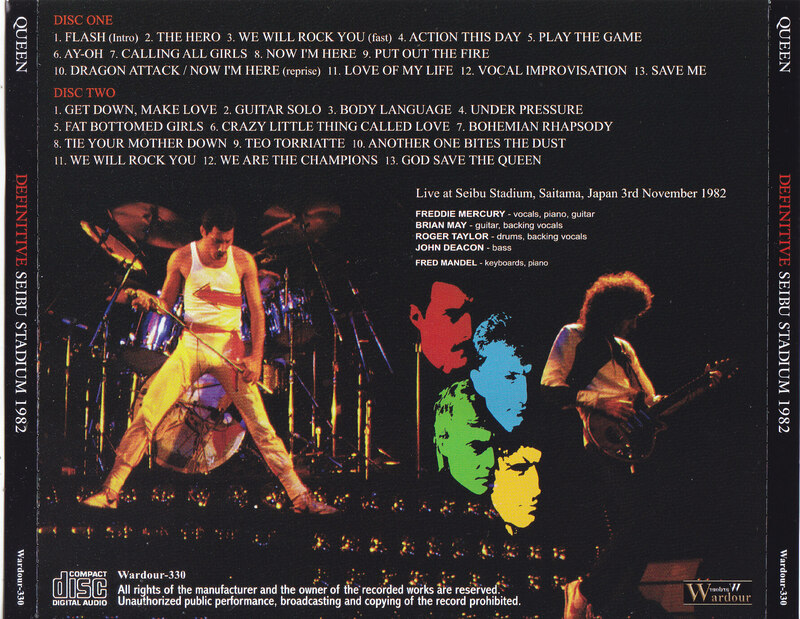 "Love Of My Life", "Save Me", "Under Pressure", "Bohemian Rhapsody", "Tie Your Mother Down", "We Will Rock You" and "We Are The Champions", which are not seen in the current "QUEEN ON FIRE", are also official sounds It can be enjoyed on the board, and the other songs can be tasted with the best existing sound. Also, the show itself is very valuable. "Love of My Life" which was not done in other countries and "Teo Torriatte" unique to Japan are also impressive, but "Teo Torriatte" is especially impressive. It was originally played only in Japanese performances in 1979 and 1982, but the arrangement is also different. Brian was playing the piano, probably because there were no support members in 1979, but Brian's guitar came in 1982. What's more, this is only Sapporo and Seibu Stadium in 1982, and you can enjoy the super-precious version that has been limited to two times on the sound board. Also, not only guitars. In 1982, the first chore was in English only, Japanese was skipped, and it was a short arrangement to go to A Melo (Sapporo the day before is such arrangement). However, the spectators tried to chore according to the record, so they thought that it was a mistake and even laughed out. So far, "Brian's mistake" was a definite theory, but it may be that Roger who put Phil more than that was a mistake (though I do not know the truth). At the end of this show, QUEEN has suspended its activities. The four were dedicated to solo activities and took about 22 months to return to the stage as QUEEN again. It is a show of such a milestone that is included in this work. It is a great masterpiece that updated the longest and highest peak by making full use of the soundboard, the rerecording of the reborn name recording, and the new excavation master as well. The unanimous feeling of unity is still that of "SPACE BOOGIE", but this song is a live album in which every song goes through a full show with the highest quality continuous in every scene. Please enjoy it with the permanent preservation press 2CD. Live at Seibu Stadium, Saitama, Japan 3rd November 1982 PRO-SHOT Copy of the officially released video 'Live In Japan'. This Press 2CD is a definitive live album that has been updated not only the official sound board but also the two audience recordings, and the longest and highest peak. Of course the traditional official pro shot is the best choice for that bonus. One of the legendary official live videos, reprinted with the highest quality ever recorded, is included. The true image of such a work is, of course, the official video work "LIVE IN JAPAN. QUEEN is a band that continued to announce not only the album but also the film with ambitious work, but this work is also a live image that they first appeared in the world (live itself "WE WILL ROCK YOU" is half a year ago However, this work is ahead of the software development). This video was released in Japan alone. It has been relapsed several times with VHS and laser disks, but is unannounced worldwide. 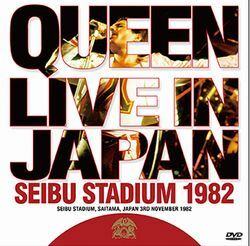 In 2004, DVD was also realized as a bonus image of "QUEEN ON FIRE: LIVE AT THE BOWL", but it is also half-finished, with a net content of 6 songs. It is a legendary film that has garnered eyes of envy from foreign enthusiasts. In this work, the highest peak of such official video. Even if it is a Japanese disk laser disk, it uses Mint Quality disk which Core Mania has kept secret, and consigns it to a specialist manufacturer of analog video overseas and converts it into DVD in a professional high-end environment. The picture beauty is just the best ever. The laser disc is different from the scan line standard from the VHS, but the image beauty without any distortion of the screen or the runout, which is the fate of the magnetic tape, further spreads over the screen. What's more, digitization by a professional manufacturer pulls out all the information dorms that laser disks had, and it is much more glossy than memories used to be seen in consumer electronics. Even in the previous reprint series, we have received a great reputation for being "cleaner than our laser", but you can also enjoy the quality of a special grade in the collection. The figure of the young QUEEN drawn in such quality is full of dazzling radiance to the eyes. To be honest, there is only the final performance of “HOT SPACE TOUR 1982” which lasts for 7 months and I can not hide the tiredness of the tour (so it may not be possible to expect a large-scale DVD production). Freddie Mercury is not particularly good for compliments, especially if it hurts Nodo in November's cold outdoor performances, but it has a strong ability to bounce back the cover, the willingness to squeeze out her voice. The feeling of bursting up was felt in the audience recording, etc., but the performance using the 36-year-old body makes the video come closer to vivid. You can witness it with the official pro shot of the highest peak ever (even if it's officially released ... instead). Although the reduced size of about 1 hour is far from full set, "Love of My Life", which was not done in other countries, and "hand in hand" unique to Japan are also included. As I mentioned in the commentary on the main press 2CD, I played live on the stage with guitar-incorporated "hands-on" twice in 1982. It is a miracle that the super intense rare version was left in the official pro shot. Not only that, but songs such as "Flash's Theme / The Hero" and "Put Out The Fire" and "Save Me" are also the last performances for Freddie. It is the songs that make the first live work and the last melody approaches the heart. QUEEN which always thought Japan special. Unfortunately, although I was not good at it, I selected Japan for my first live work and showed me a hot performance to push back the upset. It is a monument where the official engraves the Japanese singing voices they loved. A video work created by mania in the world. The highest quality board ever recorded. Please enjoy it in conjunction with the main story press 2CD of the final album live album. The final board "DEFINITIVE SEIBU STADIUM 1982" will be accompanied by a special bonus title "SEIBU STADIUM 1982: UNCIRCULATED MASTER" for "This weekend only". This is the audience master who will be the world premiere. This is a special program for this week, so please order early. The official official pro shot "LIVE IN JAPAN: SEIBU STADIUM 1982" comes with a bonus, but this is a blockbuster title of 1982. I think that many people already have. For such collectors, we have prepared a special "UNCIRCLATED" bonus. 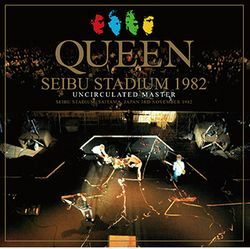 Such this work is the live album of "November 3, 1982 Seibu Stadium performance" same as the main story press 2CD. However, it is neither an official sound board as known until now, nor a recording familiar with SPACE BOOGIE. It is an audience recording that will be released for the first time in the world. In the first place, this show had very few audience recordings because the official video was so famous. Therefore, “SPACE BOOGIE”, which tells of the full show on the day, was welcomed, but the audience recording on the day was not only one of them. There has been a masterpiece recording that has not been distributed among collectors. That is this work. It is another recording that was also used as a complement to the main press 2CD. The quality is a vintage recording with a wonderful clearness. As expected, I can not expect a core as lonely as "SPACE BOOGIE", but the performance sound and singing voice will be delivered straight to the hands with clear sound only at the Seibu Stadium without a roof that reflects the sound. In addition, the master direct has a superb freshness without dubbing deterioration, and the noise is extremely loud. Even though there is a sense of distance, you can taste the details well. What's even more wonderful is the documentary of those days. It is not as vivid as the “SPACE BOOGIE” master, but it is a very realistic 80's western music fanlike handclap, and the choir and response are also super-realistic in a large chorus, and it can be thrown by Freddie's every move The cheers are also hot. Moreover, the audience's breath is not clear in the open space, and there is a sense of openness. You will be immersed in the huge stadium spectacle. It is such a clear sound, but there is also a wake even though this work has not been distributed. Actually, the middle part of the show is missing. Although the first half contains "Flash", it took about 40 minutes to change the tape with "Dragon Attack / Now I'm Here (reprise)". The recording was resumed from "Fat Bottomed Girls" and has been recorded until the end. In other words, five round songs + guitar solo from "Love Of My Life" to "Under Pressure" are missing. I would like to go further and in fact, only the latter half of this recording has been in the past. However, the first half is the world premiere of genuine. It is unclear whether the middle part was recorded and then the tape was damaged or it was not originally recorded. Anyway, it is all in 78 minutes 12 seconds of this work that exist. Another expression of Seibu Stadium that became clear beyond the time of 37 years. Although it is not perfect recording, it is an excavation of a new and extremely valuable audience recording that no one has ever heard. One of the treasures to be given to collectors and brothers who can not move their fingers anymore with just a large standard pro shot. Please enjoy it in conjunction with the main story press 2CD that renews the longest and highest peaks.